Gardeners and farmers love to complain about the weather. Weather is a constant in our lives, even as soil is. By our lights, Mother Nature never quite manages to get it just right. It is too hot. It is too dry. It is too cold or too wet. But Mother Nature would say to us that the weather is always just right. It is always exactly what it must be in response to the natural processes of the planet. I've been thinking about weather quite a lot lately, because we've had an unusual summer of weather. While much of the Northeast and corresponding latitudes around the earth have been suffering from triple digit temperatures, we here in Southeast Texas have had a relatively mild summer with occasional rains. This is a stark contrast to what we experienced last summer with very high temperatures and drought that burned our plants and increased our water bills. Indeed, that is the usual pattern for our summers and so this spell of temperate weather has been a pleasant interlude. We should enjoy it while it continues for I fear it won't last much longer. Weather is such an interesting topic, one that people never tire of talking about, and the most interesting thing about it for me is what generates our weather. Why do the rains fall and the thunder rattle our rafters? Why do the winds blow? Conversely, why does rain not fall for weeks on end at times? Of course, there are complicated answers to those questions having to do with temperatures of the oceans and with air pressure and topography and the water cycle and many other things which I understand only sketchily. The National Oceanic and Atmospheric Administration is our agency that tracks and reports on such things. As well as weather, they track the larger, longer patterns that comprise climate and they just issued their latest report on that subject this week. But climate is not weather. Weather is the short-term conditions that we experience and complain of, while climate is weather writ large. Climate is the sum total of conditions over decades, centuries, or millennia. Climate, though, may affect weather, and global climate change can have an impact on our daily lives, as NOAA points out, in longer growing seasons, increases in heavy downpours, earlier snowmelt, increased flooding, even in colder winters in some areas. There are so many things that affect weather, though. There are well-known phenomena like El Nino/La Nina, the currents in the ocean, the humidity and temperature of the troposphere - it hurts my head just to think about it. And that's another thing. Every summer as it gets close to my August 9 birthday, I start having headaches. I refer to them as my summer headaches because I don't have them at any other time of the year. Now, maybe it's partly psychological because I just don't want to face getting another year older, but I think it's mostly environmental. There's something in the air at this time of year that hurts my head, even if the weather is pleasant. Ozone, maybe? Anyway, headaches are a good excuse for staying inside and leaving the garden to find its own way at this time of year and I almost always do. "Finding its own way" means returning to the wilderness that it almost is anyway. It's a time of rest for the garden as well as me when I don't struggle to bend it to my will. So, I sit inside in the cool with my iced tea and read my books and think about things. I pity those people in the Northeast and elsewhere who don't have air conditioning because they thought they would never need it. And I ponder the origins of our weather and what next week will bring us. We are almost at mid-summer now. That point will come around my birthday. Will our relatively pleasant summer weather continue to hold, or will we see a return to normalcy? Whichever way it goes, I suspect we will find something to complain about. Reading about Lois and her family, though, brought some very interesting information to light for me. Lois' scientific name, as most of the world probably knows by now, is Amorphophallus titanum, referring to the shape of her bud and its size. 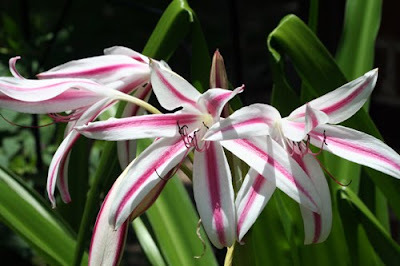 It is one of, if not the, biggest flowers in the plant world when it opens completely. 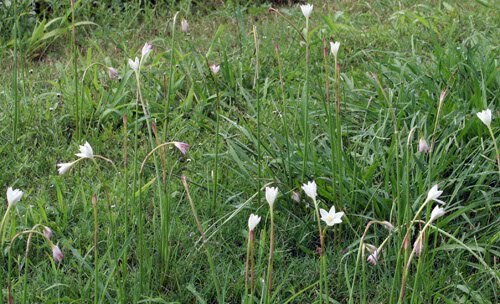 It is related to such plants as calla lilies and taro. Its family name is Araceae and, in addition to having some of the biggest blossoms in the world, this family claims some of the smallest. What is perhaps the smallest of all is very common in the Houston area. Here's proof. 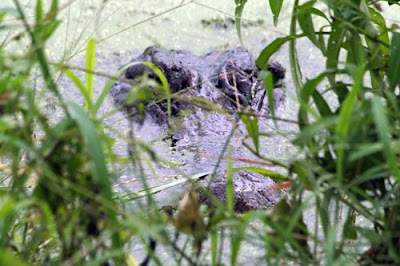 This is a picture taken at Brazos Bend State Park's Elm Lake a couple of weeks ago. 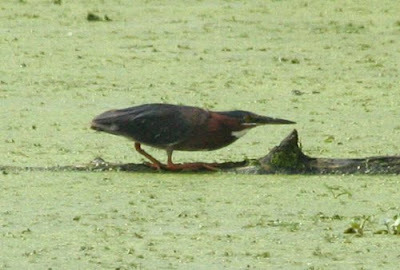 That's a Green Heron hunting from a submerged log in the middle of the lake, but he is surrounded by a thick growth of duckweed that virtually covered the lake. The lake itself was a bowl of duckweed soup on that day. And duckweed, it turns out, is a relative of Lois and it has some of the smallest blossoms in the plant kingdom! Photo by Christian Fischer, courtesy of Catalogue of Organisms. 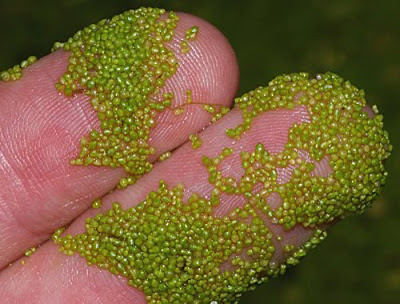 Each separate green dot on the two fingers in the picture is an individual plant, specifically Wolffia arrhiza, one of the duckweeds. Duckweeds are obviously minute, individually, but they grow in uncountable profusion across the surfaces of many still bodies of water, of which we have thousands in Southeast Texas. The flowers of duckweed are correspondingly tiny and are produced only rarely, just like the Amorphophallus titanum. Duckweed mainly reproduces itself vegetatively. So, the next time you visit a still body of water in the area and you see the green and growing garden on top of the water, remember Lois, and say "hello" to one of her littlest cousins. My poor milkweed plants (Asclepias curassavica) look awful. 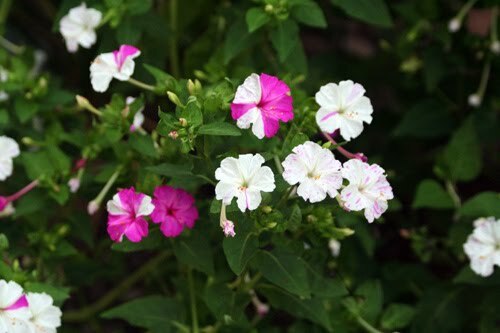 They have bloomed beautifully for weeks, but now, many of them have little more than their stems left. 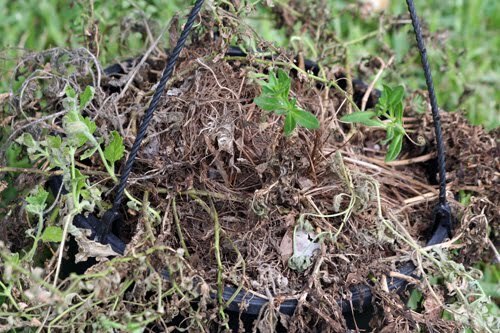 If any other plants in my garden looked this raggedy, I would be sorely tempted to rip them out and feed them to the compost pile. But not these plants. These plants are special. 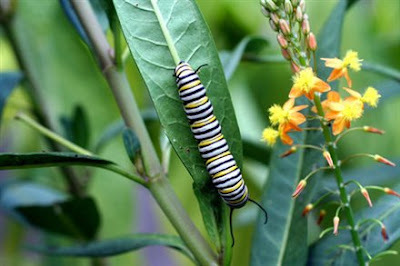 And here's the reason for their specialness - a monarch butterfly's caterpillar. 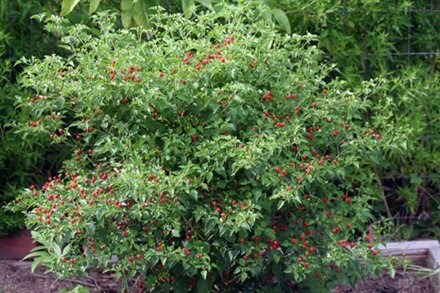 There were at least three of these guys, one on each of three plants, when I inspected them. Judging by the damage to the plants, I'm sure there have been more, as well. The butterfly weed is one of the few plants in the garden that gardeners judge to be successful only when it is virtually destroyed. A good crop of these monarch caterpillars can totally take out a stand of butterfly weed, while the gardener looks on, smiling and imagining the beautiful butterflies that will be flitting about her garden in a few weeks. The only negative that I can see about having the caterpillars is that when a plant is under stress, it transmits an open invitation to other, perhaps less desirable, diners to come and get their share. Milkweeds, of course, contain toxins that make it difficult, if not impossible, for most insect pests to feed on them, but there are a few others besides the milkweed butterflies that can make a meal here. This is one of them. 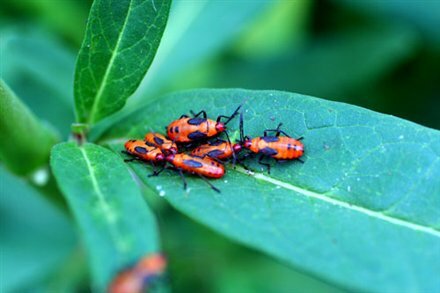 It is the red milkweed beetle, one of the varieties of longhorn beetles, and one of my plants, in addition to its caterpillar, has a host of these critters. I actually find them rather interesting as well. 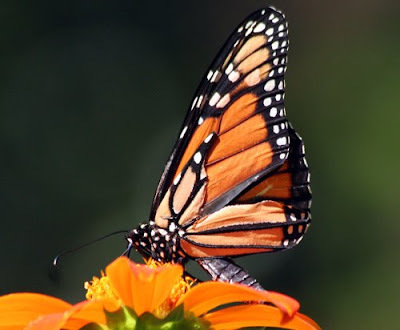 Their red and black colors serve the same purpose as the bright colors of the monarch and its caterpillar, that is to warn would-be predators that it is toxic and they had best steer clear. This is a rather disgusting sight, isn't it? 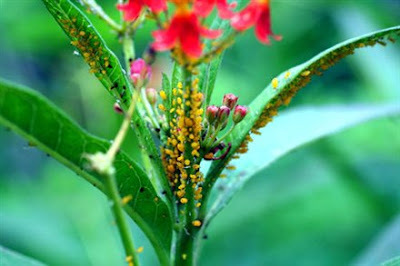 So where are all my aphid-loving ladybugs and why aren't they on the job here? 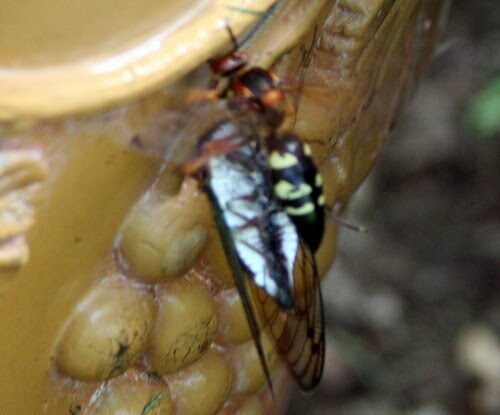 The ladybugs may be occupied elsewhere in the garden at the moment, but at least some of my predator friends are doing their best to clean up this mess. 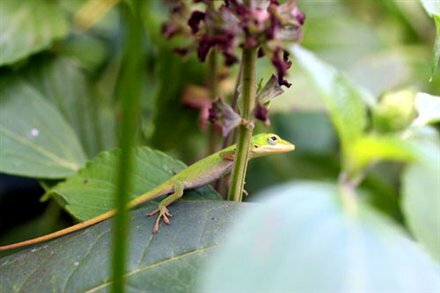 There are green anoles of all sizes among these plants. You can't really judge from this picture, but that is a butterfly weed leaf he is standing on and this guy was really small. He looked like he might just have emerged from his egg not many days before. But he is a fully-formed anole with all the instincts of his kind and he was jumping from leaf-to-leaf in pursuit of his meal. I expect he and his brethren will do their part to keep the bad guys in check. 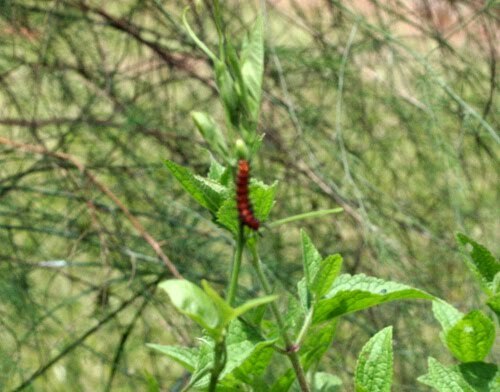 Once the "pests" have moved on, these butterfly weeds will recover and by fall they should have plenty of fresh, tender new leaves as the migrating monarchs start drifting through my yard on their way to Mexico. Then, if I'm lucky, I'll get a whole new generation of the colorful and voracious caterpillars and they can destroy my plants all over again, as I stand by, smiling. Are you one of the thousands who have been anxiously following the progress - or lack of same - of the Amorphophallus titanum named Lois at the Houston Museum of Natural Science Cockrell Butterfly Center? The plant, whose common name is "corpse flower" because it smells like rotting flesh when it blooms, has certainly raised a stink among plant geeks all over the country and even around the world this summer as its inflorescence grew bigger and bigger and it began to look as though it would burst into bloom at any minute. 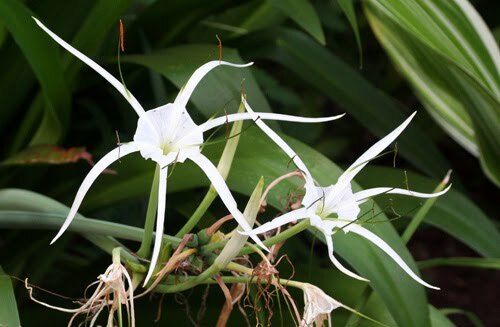 These plants are rare and endangered and they bloom only infrequently in the wilds of Sumatra, their only known home, and even less frequently in cultivation. Thus, one can understand the excitement in the plant world when it looked like Lois was just about to bloom. Personnel at the butterfly center have continued to issue updates and raise hopes that "any minute now" blooming could commence, but I just checked the Lois webcam and those petals still looked to be tucked up pretty tight. Some have even begun to ask the unthinkable question: What if she never opens her petals but just wilts and collapses instead? Lately, they've been feeding the plant hormones and rotting bananas to try to encourage her to get on with it. Maybe they should just try giving her a little privacy instead. I mean here the poor thing stands all alone and far from her native rainforest and asked to perform for all the world to see, both the hundreds who show up at the museum every day hoping to be present for the magic moment and the thousands more watching on webcam. Wouldn't you be a little nervous? Plants are only human, after all. So, I say, shut it down. Draw a curtain. Give Lois some privacy. Maybe she's really a shy violet at heart. With just a little tenderness and sensitivity, she might still produce the stench that all of Houston has spent the month waiting for! A walk through my garden in the middle of July is best taken either early in the morning or late in the afternoon. 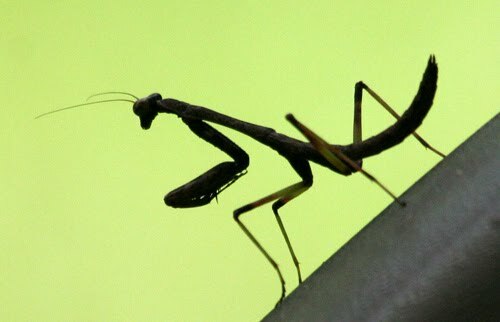 The middle of the day is hot, humid and filled with insects, not all of them friendly to humans. 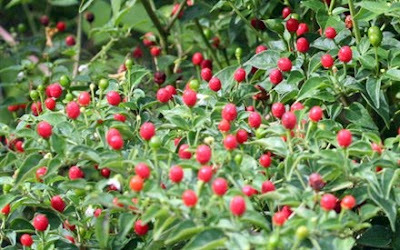 Even at this most unpleasant time of year in our climate, however, there are some hardy colorful pleasures to be noted as we stroll through the garden. The spider lilies are definitely hardy perennials that have been in bloom for about a month, but they are coming near the end of their run. And just this week the spider lilies have been joined by another hardy Southern perennial, the milk and wine lilies. 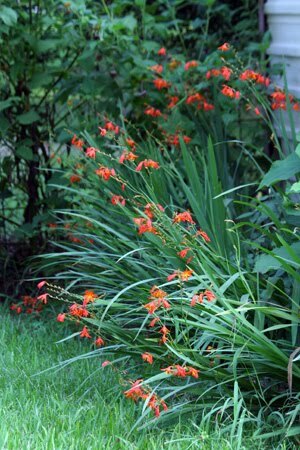 These crocosmias (variety unknown), like the spider lilies, have been blooming for about a month and look ready to continue for a while longer. They were a passalong last year from a neighbor and I wasn't too sure about them at first, but this year I've really learned to appreciate them as they've put on a terrific display for me. Bees and hummingbirds love them which is a big selling point for a habitat gardener like me. 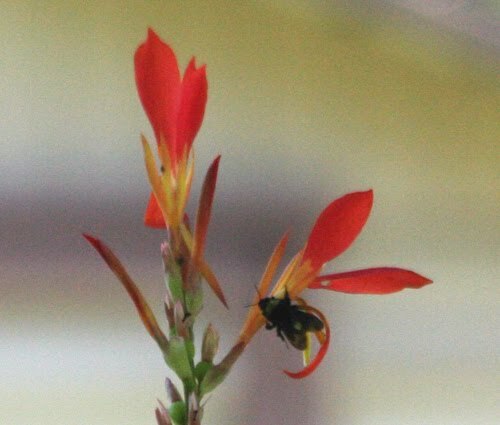 Someone suggested to me that the variety of my crocosmia might be 'Lucifer' and it could well be, but I know for sure that this variety of canna is 'Lucifer'. 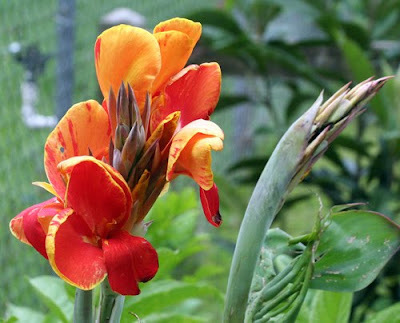 It's one of my favorite cannas. It bloomed earlier this year and now is blooming again. 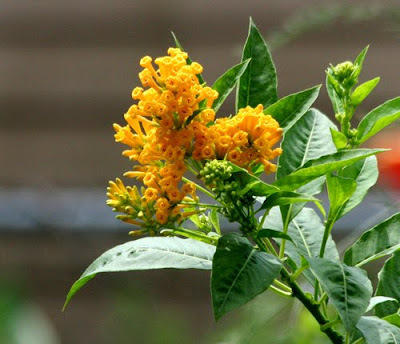 I got this yellow cestrum at Antique Rose Emporium earlier this year on their recommendation that it was a "butterfly magnet". 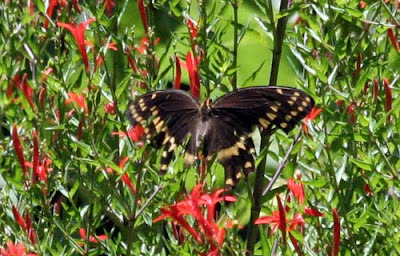 Well, the butterflies do seem to like it, especially the swallowtails, but it seems the hummingbirds like it even more. 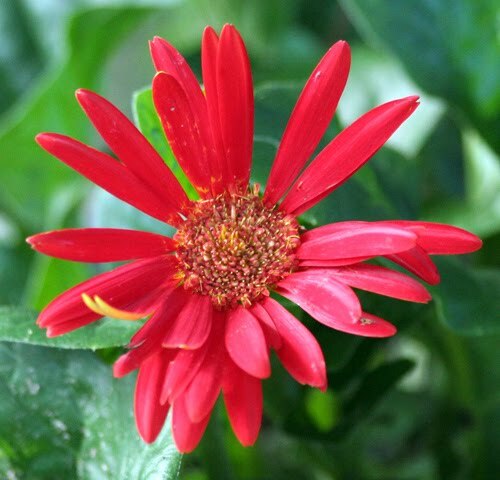 I like it, too, because it is a constant bloomer. The red gerberas are blooming again, adding a happy note to my backyard sitting area. 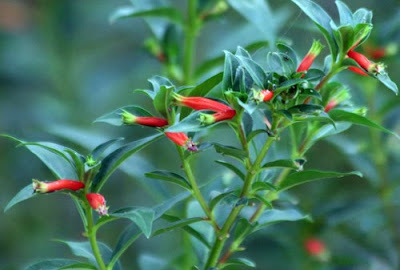 This "cigar plant" cuphea has been in constant bloom since the spring and is a great favorite with hummingbirds. 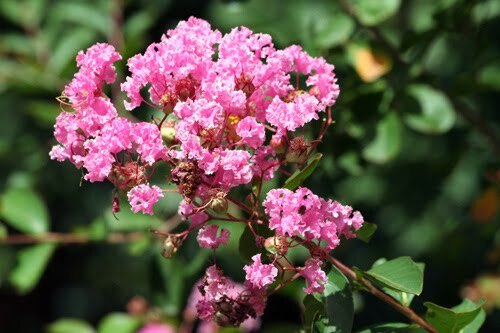 What would summer in the South be without crape myrtles? 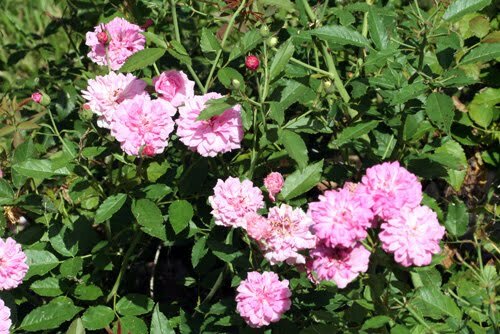 And what would summer in my garden be without these sprays of tiny pink roses from my 'Caldwell Pink'? 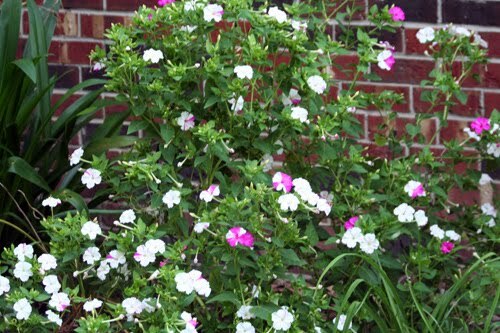 I have loved four o'clocks since childhood. I can remember being fascinated by the fact that one plant could have different colors of blossoms. Like this branch from the four o'clock shrub that shows at least five different color patterns of blossoms. But if there is one iconic flower of summer, for me it is the black-eyed Susan. 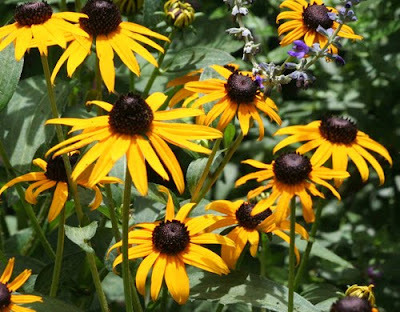 This hardy member of the rudbeckia family can take our heat and humidity and keep its perkiness. Unlike some gardeners that I could mention. Thank you for visiting my garden this month. Remember to pay a visit, too, to our hostess Carol at May Dreams Gardens to see a list of all Bloom Day participants. Just look at my lovely hanging basket! Well, once upon a time, a few weeks ago, it was lovely. I bought it at Lowe's in the spring to hang on the hook outside my den window. It was already planted with petunias, calibrachoas, and verbena and it made a nicely colorful show during late spring and early summer. 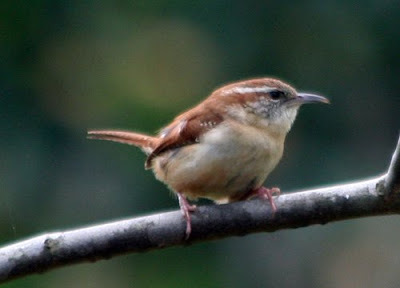 Then the Carolina Wrens moved in. One of the audacious pair perches nearby. Male? Female? Hard to tell with wrens. They moved in and built one of their nice little oven-shaped nests and proceeded to start their family. And I stopped watering the plant. Oh, I would carefully pour a cup or two of water in occasionally, and when it rained, I'm sure the planter got a little water, although the roof gutter carried most of it away. But essentially, for the last three weeks or so, the planter has been without water. All that changed on Sunday. The two fuzzy little stubby-tailed babies who had started life there hopped out of the nest and perched on the edge of planter for a few minutes and then flew away to begin their lives as fully-fledged wrens. 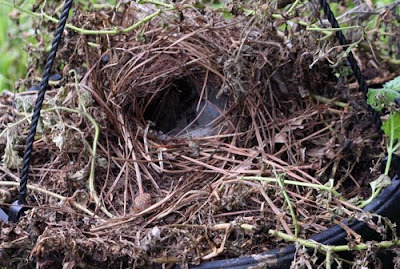 Early yesterday morning, I took the planter down and determined that there was still a little life among the plants there. Having faithfully served as the incubator and crib for new life, I decided that these plants now deserved a chance at a renewed life of their own. I removed the wren's nest, cut out the dead plant parts, pruned everything back and thoroughly watered the pot with some fertilizer mixed in with the water. Then I hung it on one of the limbs of the magnolia tree where it will get dappled shade/sun and will not have to contend with the broiling mid-day sun that it got in its former placement. The rest is up to Mother Nature. 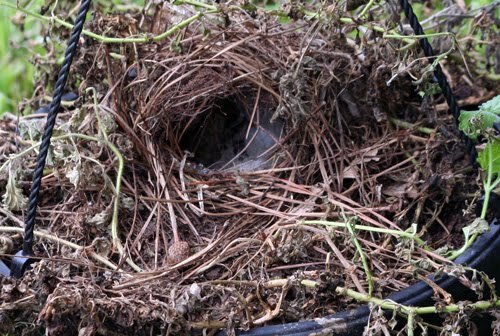 Perhaps the plants can come back - if only those darned wrens don't decide to nest there again! I was working on the south side of the backyard in the area where the bluebird box is located. 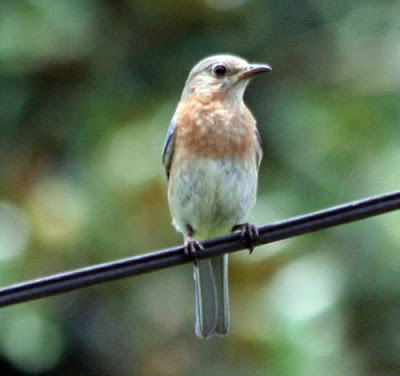 Whenever I work there, one or both of the bluebirds keep a close eye on my movements. Yesterday, it was mostly Mom who was on guard duty. She would perch on the utility wire just above their nestbox and cast a beady and suspicious eye my way. I was pulling weeds and grass from the beds on that side of the yard. It is amazing how fast these things grow when they get just a little rain. It had not been that long since I weeded there, but the beds were full of things that shouldn't have been there. I ended the day with a large pile of greenery for the compost. 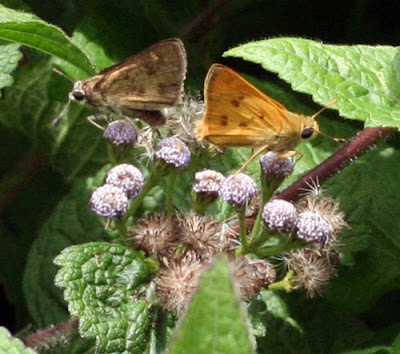 In the bed adjacent to the passionvine, I happened to notice these two little skippers on a fading mistflower. I think I probably disturbed them when they were just getting friendly with each other, so we'll just draw the curtain here and let them get on with it! After all, my yard can always use a few more cute little skippers. Early yesterday morning we headed out on a day trip to Brazos Bend State Park. It was a birding trip I had wanted to make for a while, specifically to look for the Purple Gallinules that are spending their summer there. 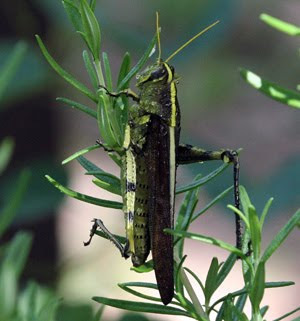 But as I knew from previous experience, Brazos Bend holds many treasures besides birds. As it happened, the day that we had chosen to make our trek there turned out to be one on which rain was threatening, plus it was in the middle of the week, and so we had very little company at the park on this morning. That's just the way I like it - quiet. The few other visitors that were there were obviously not there for the birds. Everyone that we met had the same question, "Have you seen any alligators?" "Why is everyone asking me if I've seen alligators?" I asked my daughter. "Well, it is what the park is known for," she said, wisely. Well, all I can say is people who go there looking for nothing but alligators don't know what they are missing! It could be said that people who go there looking for nothing but birds miss a lot, too, for there is much to see and enjoy in this wonderful place. 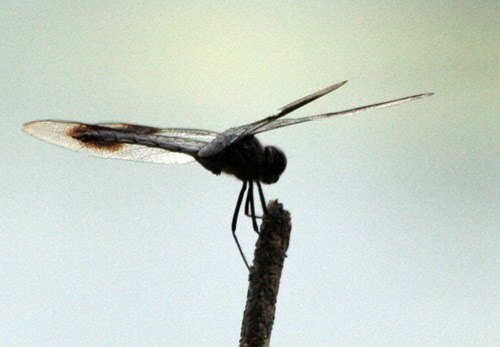 The park is dotted with lakes and wetlands which makes it the perfect habitat for dragonflies. They were out in abundance yesterday, in all color patterns including this variety with the black splotches on its wings. 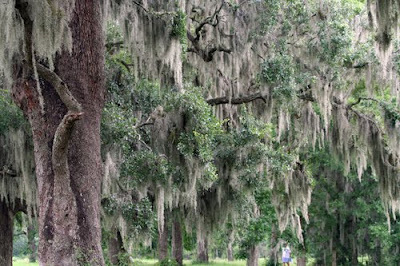 The oak trees here are all hung with Spanish moss, giving them a romantic and mysterious appearance. We encountered several of these "fairy rings" and partial rings along the trail. 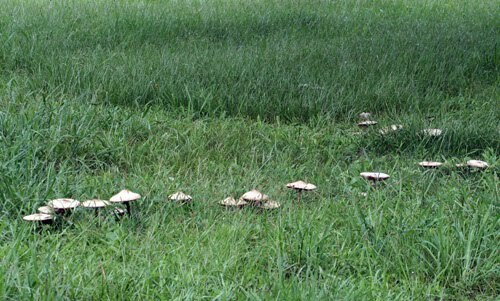 Obviously, the fairies have been dancing a lot there lately. There were also lots of these shelf mushrooms on dead trees throughout the park. The 'shrooms appeared in various colors. The most abundant butterfly in the park this day was the Queen. Unfortunately, none of them wanted to hold still long enough for me to get a good image. 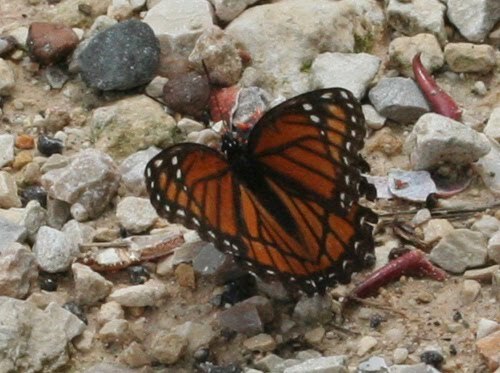 This Viceroy was a little more cooperative. He was too intent on extracting minerals from the earth to pay much attention to me. 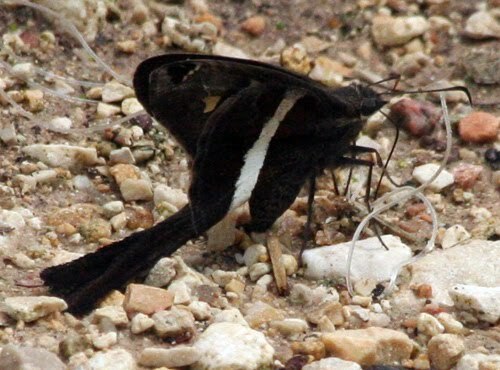 I saw several butterflies doing this, including the White-striped Longtail Skipper that I showed you yesterday. There were butterflies everywhere in the park, including a beautiful Tiger Swallowtail that I chased without success. 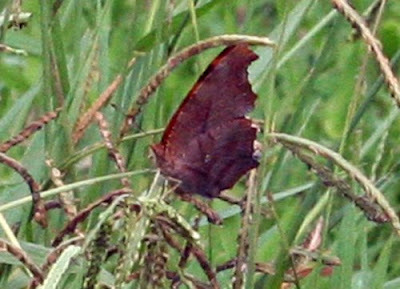 This Question Mark sat for me, but I tried and failed to get an open-wing shot of the critter to show its markings. 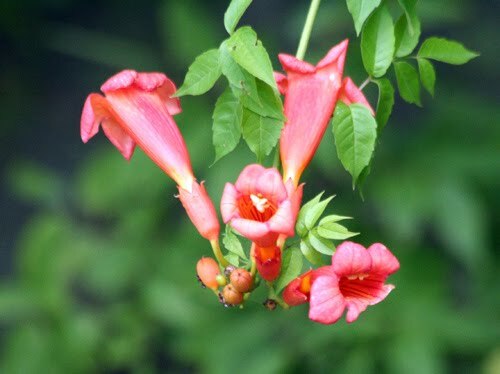 The trumpet vines didn't mind holding still for their portrait. They were all over the park, and where you have trumpet vines, you usually have hummingbirds, but I didn't see a single one during our explorations. There were many wildflowers in bloom including this delicate little beauty. It was too shy to tell me its name. 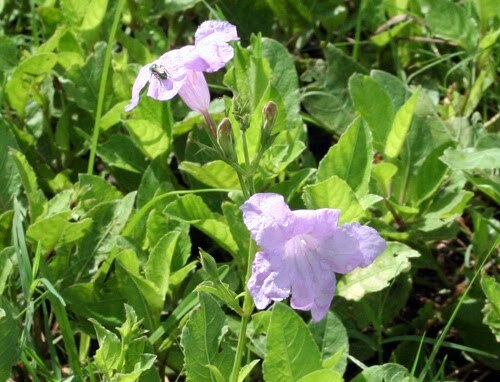 This very common little flower in the park is apparently a member of the ruellia family. 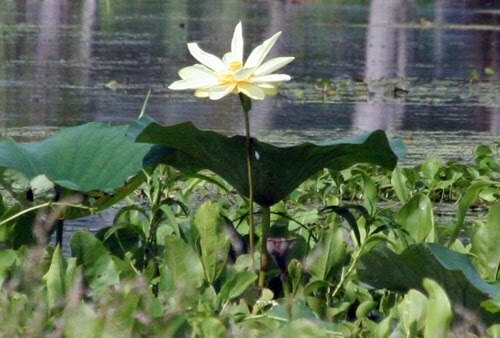 This water lily bloomed all around the edges of Elm Lake, springing up from huge lily pads. Sometimes amid all the greenery, we would encounter a silent watcher in the form of the red-eared slider turtle. And occasionally we would see the reptile for which the park is known, the American alligator, watching us from among the vegetation. 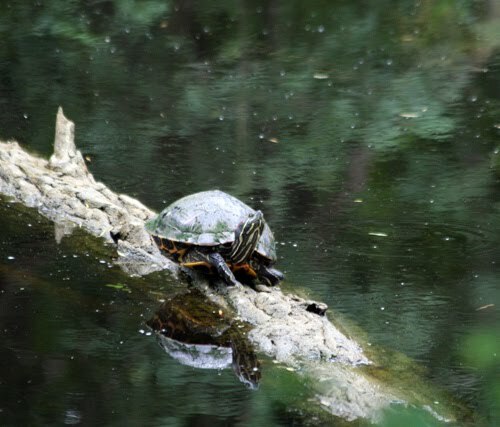 On some days at the park, you will find these big guys sprawled alongside or even across the trail and one has to be careful to give them a wide berth. Yesterday, though, there was no sunshine to entice them out of the water and so they just lay there in the mud and duckweed and watched us, perhaps judging which parts might be tastiest! Now if you want to know about the birds that I saw, you will just have to visit my Backyard Birder blog. 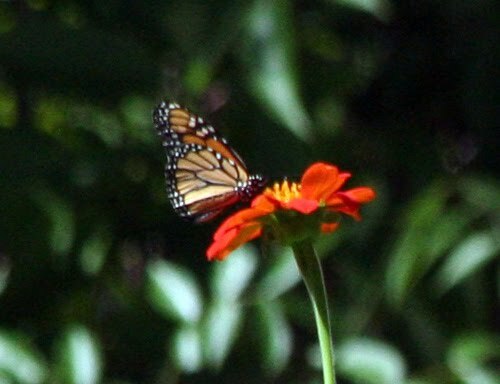 Yesterday, I staked out the Mexican sunflowers hoping to get some pictures of the many butterflies that nectar there every day. I did get a few pictures and missed on a lot more. I also found a few bonuses among the flowers. 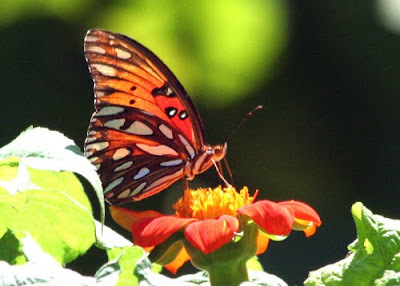 There are many Gulf Fritillaries in the garden just now. I recently added a passionvine to give them a place to lay their eggs. 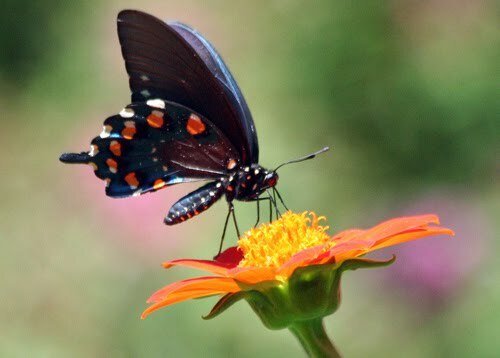 A single line of seven large orange dots on the hindwing mark the Pipe Vine Swallowtail butterfly and set it apart from other black swallowtails which mimic the Pipe Vine in order to scare away predators. This poor Giant Swallowtail could have used something to scare away predators. He's obviously had an encounter with at least one predator, maybe more. He's lost much of his hindwings, but he's still flying. Here's another view of the mutilated Giant Swallowtail as he rested among the leaves of a hamelia. 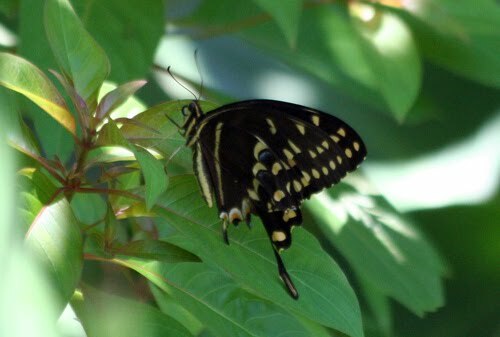 You can see that he still retains the right half of his swallowtail. I'm seeing a few Monarchs in the garden now, although not nearly as many as in recent years. You can't see the extent of the damage from this angle, but this Monarch, like the Giant Swallowtail above, has had an encounter with a predator and has lost part of his hindwings. 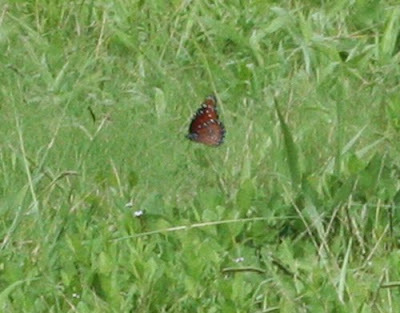 While I was photographing the butterflies, this butterfly-sized object flew across my field of vision. I followed the course of its flight to the trunk of the nearby sycamore tree. When I went to find it, even though I saw where it landed, it was hard for me to see it. It was a large moth, close to the size of a Monarch. 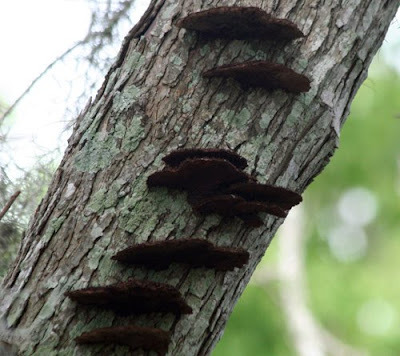 It is very cryptically colored, blending in with the bark of the tree. 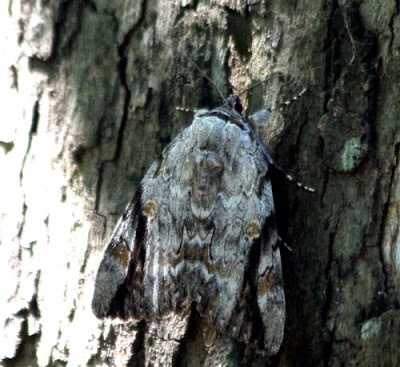 I'm not sure which moth it is. It could be one of the sphinx moths or possibly one of the "underwing" or Catocala moths which are known for hiding on the bark of trees. 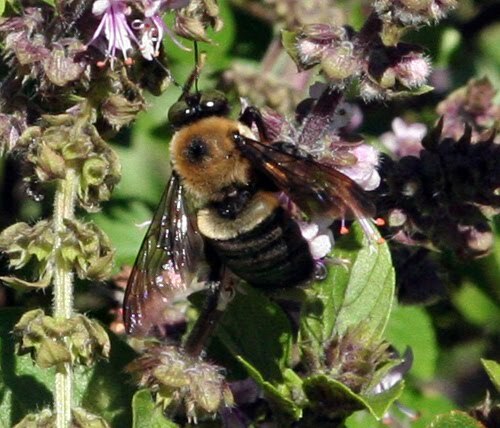 National Pollinator Week may be over, but every week is pollinator week as far as flowers are concerned. There were also lots of Skipper and Sulphur butterflies among the flowers today, but they were just too "fluttery" and wouldn't pose for me. There were other critters, though, that were not so shy. 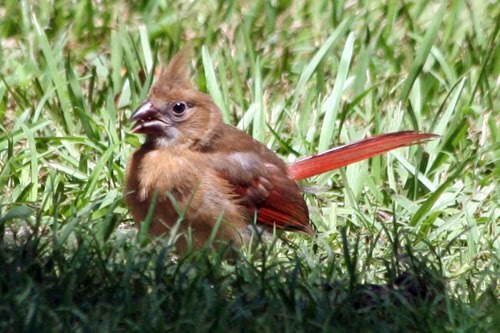 There are lots of young cardinals around just now. 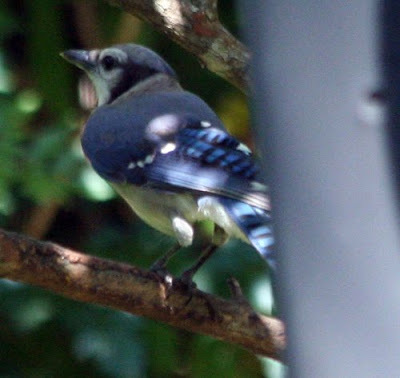 Many of them like to feed on the ground underneath the bird feeders, along with the doves. This one is cracking a seed. 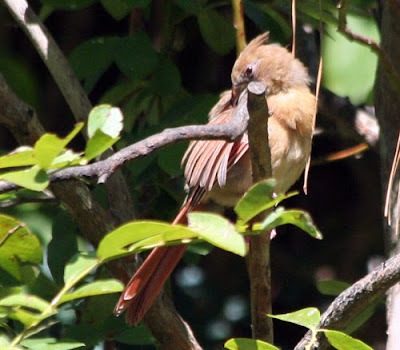 I wonder if young birds have to be taught how to preen or if the instinct comes naturally to them. However the skill comes, this one is practicing it and seems to be enjoying the process. Nearby, a young Blue Jay sitting in the blueberry bush is partially hidden by the bird feeder post. Back among the flowers, it's not all butterflies, moths and bees. 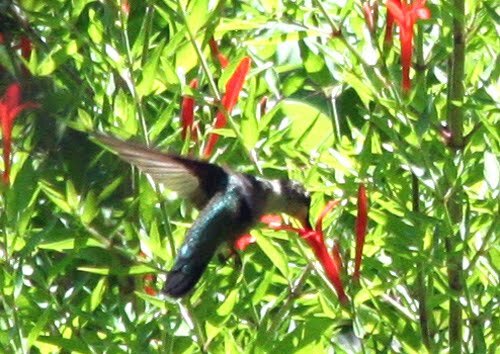 The female Ruby-throated Hummingbird takes her turn among the blossoms of the Anisacanthus wrightii. These blossoms are favorites of both the hummingbirds and the butterflies. And what would a day in the garden be without a visit from a squirrel? 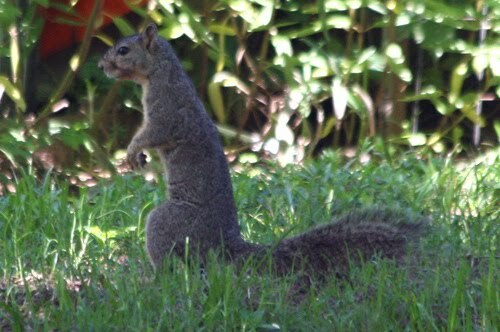 Or, more likely, several squirrels. This one had caught the scent of a bag of fruit and nut birdseed mix that had been left outside of the metal container where we keep the seed. When I heard paper ripping a few minutes after I snapped this picture, I went to see what was happening and caught the culprit in the act! Believe it or not, in between all my wildlife watching yesterday I also managed to get a little work done in the garden.